Korr (1970) believed the musculoskeletal system to be the “primary machinery of life” as cited in Chaitow (2011), and it can be acknowledged as the most important of all the body systems due to its influence and impact upon physical activity – one of the basic functions of life. Optimal functioning of the musculoskeletal system is important throughout our lives from childhood to older age, and improves bone health, strength and cardiovascular fitness – in turn, encouraging functional independence and enhancing quality of life, while decreasing the risk of developing long-term conditions. The Industrial Revolution of the 18th century led millions of workers to move from farming to factory work, and with this their lives immediately became less active. For more than 60 years, there has been growing evidence to suggest that sitting down is bad for health. Morris (1953) conducted a study of transport workers in London that demonstrated that bus conductors who had an active job were found to have a decreased incidence of coronary heart disease when compared directly with the bus drivers who were in a more physically inactive role. Fast forward to the present day, and the negative health effects of a sedentary lifestyle are still being widely reported and increasingly documented and discussed (O’Reilly, 2016). Public Health England has produced the “One You” campaign (2016) highlighting the impact of the modern lifestyle. This is stated to be leading to the “worrying” health status of individuals aged between 40 and 60 years old. Poor health status is denoted to be attributed to being overweight or obese, taking too little exercise or drinking alcohol excessively. Professor Sir Muir Gray, the campaign’s clinical adviser, has suggested that our busy lifestyles and desk-based jobs make it extremely challenging to lead a healthy life. Workers may spend two or more hours each day on their daily commute. Once at work, they remain in a seated position for eight hours per day. Additionally, activities undertaken outside work commonly involve seated positions too, such as watching television, or visiting a restaurant, bar or cinema. Alter et al (2015) and Biddle et al (2016) have both concluded that there is evidence for a causal relationship, among adults, between sedentary behaviour and morbidity and mortality from disease processes including cardiovascular disease, cancers and type 2 diabetes. These effects were reduced among individuals who were more physically active. It is recommended that adults undertake at least 150 minutes of moderate-intensity physical activity per week (WHO, 2015). It is further suggested that individuals should reduce any prolonged periods of sitting, since this is known to be a risk factor for ill health regardless of other activity levels. The British Heart Foundation (2015) states that, in the UK, 44% of adults never do any moderate physical activity. Of these, a staggering 9% never do any walking. Could this potentially be one of the reasons for our high levels of cardiovascular disease? Do we need to move more? Cardiovascular disease is stated to be the cause of 26% of all deaths in the UK. Conversely, the Whitehall II study, in which 5,132 civil servants were followed up over a 16-year period, demonstrated that sitting time was not associated with an increased all-cause mortality rate over the study period. However, the participants were noted to have a higher than average activity level as London-based employees are said to use more active travel methods such as travelling by bicycle, walking or standing on busy trains (Pulsford et al, 2015). The working population spends more than one-third of their waking hours at work, therefore the workplace should be one of the ideal settings for health promotion activities to take place (Chau et al, 2015). So should employers be doing more to inform and educate their employees and encourage them to increase their physical activity levels? Increasing amounts of research and growing media coverage has highlighted our sedentary behaviour at work and advocated the introduction of standing working as a method of decreasing our time spent seated. Standing working has been described as one of the potential solutions to back pain at work. Matthews (2015) questions whether or not the case has been made for this change yet, suggesting that the introduction of standing working could potentially be met with resistance. Staff express concerns that there will be an expectation that they will stand all day. Also, although there is evidence that sitting for prolonged periods may have adverse effects on our health status, there is also research in relation to standing for prolonged periods and its negative impact on our musculoskeletal systems. Standing is a natural human posture, but maintaining this requires significant muscular effort. Working in a standing position on a regular basis for prolonged periods of time may lead to foot pain, leg swelling, varicose veins, general muscular fatigue, low back pain, discomfort in the neck and shoulders, and potentially other health problems (Grandjean, 1988). This adds weight to the idea that perhaps merely standing up is not the answer; it is movement that is key. The Department of Health has funded a three-year randomised cluster trial of the use of sit-stand desks, which aims to investigate 240 desk-based NHS staff, with half of them acting as a control group. increase gained in objectively measured physical activity levels following the introduction of sit-stand workstations (O’Connell, 2015). The effect of sit-stand desks has been shown to reduce sitting in the workplace by between 30 minutes and up to 2 hours per day by Shrestha et al (2016). When combined with information and education regarding the benefits of reducing sitting periods both at home and in the workplace, this can reduce total sitting time per day and the number of sitting episodes of more than 30 minutes. To reduce the risk of staff developing musculoskeletal disorders associated with seat-based computer tasks, the Health and Safety Executive (HSE, 2013) recommends a neutral posture. To achieve this, the following is advised: when the hands are placed on the keyboard, the forearms are horizontal, avoiding any elevation of the shoulders; there is sufficient space in front of the keyboard to rest the upper limbs; a neutral wrist posture be maintained; and that regularly accessed items are located within arm’s reach. The HSE also advises that the monitor is ideally positioned with the top of the screen at eye level to allow a neutral neck posture to be adopted and maintained while performing computer-based activities. This posture should also be applied to standing-based computer tasks. The desk should be elevated to a height sufficient to ensure that the forearms remain horizontal when the hands are on keyboard and that all other aspects of the neutral working posture are applied. It was noted by Callahan (2015), however, that upper-limb postures associated with computer-based tasks vary between sitting and standing. Therefore, ergonomics training is vital in providing employees with the knowledge and skills to be able to adapt their workstation in both positions to reduce any potential discomfort. It is critical to have a full appreciation that it is not merely standing up that is the goal – it is movement and variation between postures throughout the day. Movement can be relatively easy to build into the working day. Instead of sending emails to colleagues in an office next door, we should be walking over to them to discuss work-related issues. Other measures include: taking the stairs instead of the lift; using active methods of travel to and from work; and letting someone else sit down on the train. There are many ways to introduce light physical activity into our daily lives that don’t require the procurement of expensive office furniture and equipment, although the latter would help. A statement commissioned by Public Health England (Buckley et al, 2015) recommended employers aimed to reduce the amount of time that employees spent sitting. This could be achieved by: regularly alternating sitting with standing- based work; introducing the use of sit-stand desks; and taking short, active standing breaks. They further recommended office-based individuals achieve two hours per day of standing-based and light activity tasks during the working day, with the aim of moving towards four hours per day. Callahan (2015) concurs with this and further states that any perceived musculoskeletal discomfort associated with either a sitting or a standing posture will be reduced if an individual is adept at altering their postures as required while maintaining their productivity. Potential barriers to the introduction of standing working have been investigated in an Australian workplace by Grunseit et al (2013), who found that the introduction of sit-stand desks was well received overall, but users felt they would have benefitted from further instruction. Self-reported qualitative information from participants included reports that standing in one spot was stated to be placing increased pressure upon the lower back. Another participant reported that after a period of standing, a compelling need to sit down was felt. Conversely, other individuals expressed an increased sense of wellbeing and reported feeling more alert and productive while standing and working. A further potential barrier to encouraging employees to alter their posture during the working day could be whether or not the sit-stand desks are electrically or manually operated. Chau et al (2014) concluded in their study that workers were less likely to alter the position of the desk if it was manually operated as this required more physical effort and took longer to adjust. In a well-designed workplace, the worker would choose from a variety of well-balanced working postures and alternate between these frequently to equalise the distribution of load on different parts of the body, and thereby improving the vascular supply to the muscles. This is in agreement with Franco and Fusetti (2004), who stated that Bernardino Ramazzini, the Italian physician dubbed the “father of occupational medicine”, foresaw the problems associated with prolonged stationary postures and advocated an “everything in moderation” philosophy to prevent musculoskeletal disorders. The consensus within the literature suggests that neither sitting nor standing postures are the solution to musculoskeletal disorders, and that each position has its advantages and disadvantages. The major risk factor is prolonged periods of time spent in a static posture. Movement is key, along with other health promotion goals, such as: increasing physical activity; improving nutrition; reducing alcohol intake; stopping smoking; and stress reduction. Employers should also inform and educate employees. The most important point being that sitting, both at work and in leisure time, should be limited to decrease the risk of developing musculoskeletal symptoms and other chronic health conditions. Most people in employment spend more of their waking hours at work than at home, so the workplace is a good place to start the education process of the health benefits of a less sedentary lifestyle. Jenefer Fraser BSc (Hons) Healthcare, BSc (Hons) osteopathy Dip HE adult nursing is a back care adviser and OH nursing student at Imperial College Healthcare NHS Trust. Alter DA, Biswas A, Oh PI, Gaulkner GE, Bajaj R, Silver MA and Mitchell MS (2015). “Sedentary time and its association with risk for disease incidence, mortality, and hospitalisation in adults: a systematic review and meta-analysis”. Annals of Internal Medicine, vol.162(2). Biddle SJ, Bennie H, Bauman JA, Chau AE, Dunstan JY, Owen D, Stamatkis N, Uffelen, JGZ (2016). “Too much sitting and all-cause mortality: is there a causal link?” BMC Public Health, vol.16(1). British Heart Foundation (2015). “Physical activity statistics”. London: British Heart Foundation. Buckley JP, Hedge A, Yates T, Copeland RJ, Loosemore M, Hamer M, Bradley G, and Dunstan DW (2013). “The sedentary office: an expert statement on the growing case for change towards better health and productivity”. British Journal of Sports Medicine, vol.49(21), pp.1357-1362. DOI: 10.1136/bjsports-2015-094618. Callahan JP, DeCarvalho D, Gallagher K, Karakolis T, and Nelson-Wong E (2015). “Is standing the solution to sedentary office work?”. Human Factors, vol.23(3). Chaitow L and DeLany J (2011). “Clinical application of neuromuscular techniques, volume 2: The lower body”. London: Elsevier. Chau JY Daley M, Dunn S, Srinivasan A, Do A, Bauman AE, and Pieter van der Ploeg H (2014). “The effectiveness of sit-stand workstations for changing office workers’ sitting time: results from the Stand@Work randomized controlled trial pilot”. International Journal of Behavioural Nutrition and Physical Activity, vol.11(127). DOI: 10.1186/s12966-014-0127-7. Chau JY, Sukala W, Fedel K, Do A, Engelen L, Ingham M, Sainsbury A, and Bauman AE (2015). “More standing and just as productive: Effects of a sit-stand desk intervention on call center workers’ sitting, standing and productivity at work in the Opt to Stand pilot study”. Preventive Medicine Reports. vol.3, pp.68-74. Clarke J (2013). “Is sitting down bad for your health? Some important advice for your patients”. Journal of Australian Traditional-Medicine Society. vol.19(2). Franco G and Fusetti L (2004). “Bernardino Ramazzini’s early observations of the link between musculoskeletal disorders and ergonomic factors”. Applied Ergonomics, vol.35(1), pp.67-70. Grandjean E (1988). “Fitting the task to the man? A textbook of occupational ergonomics”. 4th ed. London: Taylor & Francis. Grunseit AC, Yuk-Yin Chau J, Pieter van der Ploeg H, and Bauman AE (2013). “Thinking on your feet: A qualitative evaluation of sit-stand desks in an Australian workplace”. BMC Public Health, vol.13(365). DOI: 10.1186/1471-2458-13-365. Health and Safety Executive. (2013). “Working with display screen equipment (DSE): A brief guide”. London: HSE. Matthews V (2015). “Are sit-stand desks the solution to back pain at work?”. Personnel Today, vol.67(10). Morris J (1953). “London transport workers study: Coronary heart disease and physical activity of work”. The Lancet, vol.265, pp.1053-1057. O’Connell SE, Jackson BR, Edwardson CL, Yates T, Biddle SJ, Davies MJ, Dunstan D, Esliger D, Gray L, Miller P, and Munir F (2015). “Providing NHS staff with height-adjustable workstations and behaviour change strategies to reduce workplace sitting time: Protocol for the Stand More AT (SMArT) Work cluster randomised controlled trial”. BMC Public Health, vol.9(15). DOI: 10.1186/s12889-015-2532-5. O’Reilly N (2016). “Get up, stand up, get moving”. 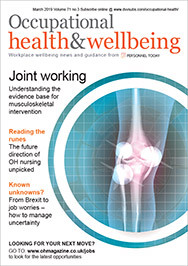 Occupational Health & Wellbeing, vol.68(2). Public Health England (2016). Press release: “Modern life responsible for ‘worrying’ health in middle aged”. Pulsford RM, Stamatakis E, Britton AR, Brunner EJ, and Hillsdon M (2015). “Associations of sitting behaviours with all-cause mortality over a 16-year follow up: The Whitehall II study”. International Journal of Epidemiology. vol.1(8). DOI: 10.1093/ije/dyv191. Shrestha N, Kukkonen-Harjula KT, Verbeek JH, Hermans V, and Bhaumik S (2016). “Workplace interventions for reducing sitting at work” (Review). Cochrane Database of Systematic Reviews, issue 3. World Health Organisation (2015). “Physical activity strategy for the WHO European region 2016-2025”. EUR/RC65/9, Lithuania: World Health Organisation.